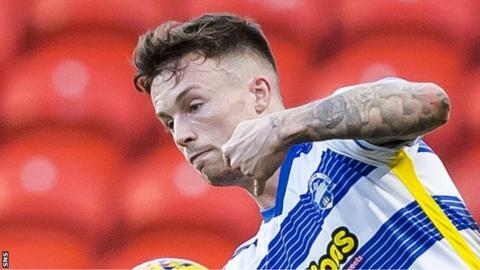 A late strike from Gary Oliver sent Greenock Morton above Dunfermline and into the Championship play-off places. On-loan Sunderland midfielder Tom Beadling gave the Pars the lead with a low strike from 10 yards, before Michael Tidser drew Morton level. Nicky Clark had an effort ruled out for offside before half-time and threatened twice with headers after the break. And Oliver's strike won it for the home side, who creep up to fourth - a point in front of the Pars. Morton, who knocked Dunfermline out of the Scottish Cup last month, also have a game in hand over Dunfermline and trail Livingston by five points. Gary Harkins had a free-kick pushed away by Pars goalkeeper Lee Robinson, and from the resulting corner Robinson came to the rescue again, blocking Luca Gasparotto's shot after he had found space in the box. But it was the visitors who struck first. A low cross from the right-hand side fell to debutant Beadling, whose low shot beat goalkeeper Derek Gaston. Scott Tiffoney headed just over for Morton before they drew level. Gary Harkins whipped in a free-kick and, after a knockdown from Oliver, Tidser found space on the right to fire a low shot towards goal, which Robinson could only push into the net. Dunfermline responded with Clark swivelling brilliantly to find the top corner only for the goal to be ruled out for offside. After the break, Clark's header from point-blank range hit Gaston and was cleared to safety. The forward had another header from a corner that drifted just past on the hour mark. Clark then set up James Craigen but he blasted over from 10 yards. Morton's winner came when substitute Bob McHugh raced through after a ball over the top, rounded the goalkeeper and squared for Oliver to dispatch into the empty net from seven yards. Greenock Morton manager Jim Duffy: "I think Dunfermline were the better side in the first half. I thought we were quite fortunate to be 1-1 at half-time. Generally speaking I thought they were on the front foot and we were just hanging on in there. "Second half was a bit more even. I thought we were trying to press the game but Dunfermline were always a threat. "We defended well but if they'd taken a little bit more care they could've won the game. As the game got into the dying stages you're just happy to stay 1-1 and make sure you don't lose it. Fortunately for us we nicked it." Dunfermline Athletic manager Allan Johnston: "I thought even at 1-0 we were quite comfortable. "We know how dangerous Morton are at set pieces. They score a lot of goals, they're really aggressive in the air. So to lose a goal, obviously at a second ball we just switch off. "Second half, I thought we were in the ascendancy. I thought we were playing well and looked as though we were going to score. "We were in really good areas and you probably have to punish teams. And then obviously we get caught with a sucker punch right at the end." Match ends, Morton 2, Dunfermline Athletic 1. Second Half ends, Morton 2, Dunfermline Athletic 1. Goal! Morton 2, Dunfermline Athletic 1. Gary Oliver (Morton) right footed shot from the centre of the box to the centre of the goal. Assisted by Robert McHugh. Attempt saved. Tom Beadling (Dunfermline Athletic) right footed shot from outside the box is saved in the bottom right corner. James Craigen (Dunfermline Athletic) wins a free kick in the defensive half. Attempt missed. James Craigen (Dunfermline Athletic) right footed shot from the centre of the box is too high. Attempt saved. Frank Ross (Morton) left footed shot from outside the box is saved in the bottom right corner. Nicky Clark (Dunfermline Athletic) wins a free kick in the defensive half. Corner, Morton. Conceded by Ryan Williamson. Attempt saved. Declan McManus (Dunfermline Athletic) right footed shot from outside the box is saved in the top centre of the goal. Attempt saved. Joe Cardle (Dunfermline Athletic) right footed shot from outside the box is saved in the centre of the goal. Robert McHugh (Morton) wins a free kick in the defensive half. Foul by Callum Morris (Dunfermline Athletic). Declan McManus (Dunfermline Athletic) is shown the yellow card for a bad foul. Frank Ross (Morton) wins a free kick on the right wing. Foul by Declan McManus (Dunfermline Athletic). Substitution, Morton. Robert McHugh replaces Michael Tidser. Attempt saved. Gary Oliver (Morton) right footed shot from the centre of the box is saved in the bottom right corner. Corner, Morton. Conceded by Nathaniel Wedderburn. Jean-Yves Mvoto (Dunfermline Athletic) wins a free kick in the defensive half. Attempt missed. Scott Tiffoney (Morton) right footed shot from outside the box is high and wide to the right. Attempt missed. Tom Beadling (Dunfermline Athletic) header from the centre of the box misses to the right. Foul by Luca Gasparotto (Morton). Attempt missed. Nicky Clark (Dunfermline Athletic) header from the centre of the box is high and wide to the left. Corner, Dunfermline Athletic. Conceded by Luca Gasparotto. Attempt blocked. Tom Beadling (Dunfermline Athletic) right footed shot from outside the box is blocked. Gary Harkins (Morton) wins a free kick in the attacking half. Foul by Nathaniel Wedderburn (Dunfermline Athletic). Tom Beadling (Dunfermline Athletic) wins a free kick on the left wing. Corner, Morton. Conceded by Lee Robinson. Attempt saved. Luca Gasparotto (Morton) header from the right side of the six yard box is saved in the bottom right corner. Corner, Morton. Conceded by Jean-Yves Mvoto.